LAZARUS SATURDAY AND PALM SUNDAY WEEKEND (4/23-24/2016) This weekend the St. George community celebrated the Feast of the Raising of Lazarus, and Our Lord and Saviour's Triumphant Entry into Jerusalem, 'Palm Sunday'. 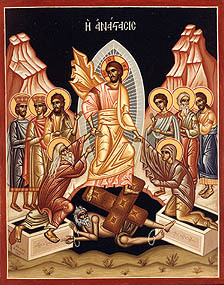 On 'Lazarus Saturday' Fr. Joel talked to the Sunday school about the Preparation of the Holy Gifts, and about what we were celebrating in Holy Week. Then on 'Palm Sunday' we blessed the Palms and at the end of the Divine Liturgy the whole community processed outside that we might participate in Lord's Holy Entrance into Jerusalem as he goes to His holy Passion. Christ defeated death! We are no longer subject to it; rather we are Christ's, who gave us "the right to be God's children" (John 1:12) and to be His "friends" (John 15:15)! What great news! What a great gift! What a great reality! An eternal bond is granted to whoever believes in Christ as Savior from death - divine adoption in Christ's name! From now on, the Lord commissioned us to be victorious not only over death "from outside," but also over death "from within," that is, over our own selfishness. He also commanded us to be messengers of the Good News and heralds of His victory - and ours, too - over any kind of death. He asked us, as Christians, to abide by love rather than by hate, by hope rather than by despair, by faith rather than by logic, by justice rather than by injustice, by forgiveness rather than by resentment, by humility rather than by vanity and arrogance, and by sacrifice rather than by self-interest. Christ defeated death in our lives! He set us free from fear: from fearing death, from fearing evil, from fearing illness and calamities, from fearing each other, from fearing the uncertainty of the future, from fearing insecurity and unemployment, from fearing violence and terrorism, and from fearing persecution and sufferings for His sake. Instead, He gave us the power and the means to seek the true freedom. The freedom to love each other even though we differ in character, education and profession. The freedom to forgive each other even though we have suffered. The freedom to ask forgiveness from each other even though we have badly hurt each other. The freedom to serve each other even though we differ in origin, background and culture. The freedom to work together even though we differ in thinking, worldview, ability and capacity. The freedom to abide by the truth and raise our children to seek Him. The freedom to defend the unjust and the needy and restore them their rights. The freedom to be at the Lord's hand, obedient, prayerful and faithful. Christ defeated death in our reality! He gave us the gift to start anew, to renew our heart, to purify our mind, and to reaffirm our commitment of faith at His service. He restored in us the dignity of our person, the beauty of our nature, and the bounty in our personality. Christ defeated death in our relationships! Christ is the only mediator between God and man. However, He made us "bridges" of salvation to reach others. As Antiochian Orthodox Christians in North America, we are bequeathed an apostolic "lineage:" tradition, inheritance and mission. In this regard, the image of the "bridge" summarizes the Antiochian witness that emerges out of the past, prompts the present and prepares the future of the Antiochian Orthodox Church on the eve of the election of a new Metropolitan to succeed to His Eminence, Metropolitan Philip of eternal memory. Christ´s victory over death is a responsibility when it is handed over to us. "I am the Way," (John 14:6) the Lord said. "We are the bridge," we would respond to Him. Indeed, the Lord means for us to be His co-workers in this most unprecedented cooperation between heaven and earth. Antiochian Orthodox, among others, are leading the work of building a bridge between East and West, between our Patriarchate and the Archdiocese, among their brothers and sisters of other Orthodox Churches in North America, among their brethren whom they invited to share this apostolic faith, toward those are in need. If Christ is the "bridge" from heaven to earth and from earth to the netherworld, saving in this way the entire creation, then you understand that being a "bridge" means to follow Christ in His openness to humanity, in bringing humanity to unity, in serving your brethren to the extent of your ability and capacity. I am glad for your witness – a bridge that unites both ends and that is open for people to come across in both directions, and for Christ to work the salvation of each one. I am sure that, as we are celebrating our Lord's resurrection from the dead, you will treasure this divine gift of being a bridge. Indeed, I am certain that you will not spare any means to serve the Divine Providence toward humanity. May our Lord guide all of us by His eternal light shown forth from the empty tomb! The mystery of Christ is very simple. Yet in order to embrace it in our lives, we need a mind and a heart as humble as His. The mystery of His love to humankind is such that it surprises us, whenever we meditate on it and are conscious of it. It surprises us because it reveals the love He has for us. He "is love" (1 John 4:8), isn't He? Christ manifested His love to us in a very particular way: the way of a bridegroom with his bride. The Church preserved from the Lord's last moments before death the image of a marriage. The "picture" she took of this wedding has been expressed in two different ways in our celebrations on the first days of Holy Week. In fact, we chant at Matins of these holy days: "Behold the Bridegroom comes in the middle of the night...", and "I see Thy Bridal Chamber adorned, O my Savior, but have no wedding garment that I may enter. O Giver of Light, enlighten the vesture of my soul, and save me." 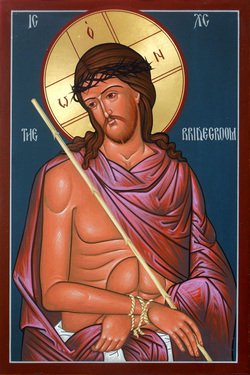 We also make a procession with the icon of the "bridegroom" with the inscription, "Behold, the man!" (John 19:5). It is the icon of the Lord of the "utmost humility," the whole image of His passion, a snapshot of His unconditional love for us. It was the last picture taken of Him before His death on the Cross. It is the best picture ever taken of Him. The Church raises in front of our eyes this "picture" in order that we recall today in our hearts His love and humility, and commit ourselves again to follow Him on the way of the Cross. The way of the Cross is not painful. The sufferings that Christ endured in His body did not hurt Him as much as did our indifference, ignorance, rejection and betrayal. We have heard His words to God the Father, on the eve of His crucifixion, in which He asked Him to "remove from Him the cup" (Luke 22:42), that is, the cup of our betrayal of His love. However, we all were also witnesses of how He wholeheartedly accepted the cup – accepted us as we are, in our own wickedness – to the end. This "end" was His love manifested on the Cross in His words of forgiveness: "Father, forgive them, for they don't know what they are doing" (Luke 23:34), but also in His triumphal death: "It is finished" (John 19:30). He did love us to the very end of His life, and to the very end of our own misery, in order to accomplish our salvation, to restore in us love and the freedom to love each other as He did (John 13:34; 15:12). Following Christ on the way of the Cross was, and still is, the very heart of the Christian "kerygma:" preaching and education. It instills in us the power of love that Christ handed over to His disciples throughout the centuries in order to befriend the "oikoumene," that is, the whole world. Abiding by the way of the Cross has one finality: to bring every human being to the knowledge of the truth - to know the Father (Cf. John 17:3), to believe in the Lord as our Savior from death and evil, and to receive the gift of life eternal from the Holy Spirit. It is a journey that we begin in this earthly life and continue throughout eternity. Practically, the way of the Cross is the same. It is "to be crucified with Christ" (Galatians 2:20), as the Apostle Paul exclaimed. I had this in mind when His Beatitude Patriarch John X of Antioch asked me to be the Patriarchal Vicar of this God-protected Archdiocese. Therefore, I want to ask that each of you, beloved members of this Archdiocese, see how you can "translate" such words in your own lives, behaviors and activities, in a practical, but heavenly, way. In fact, all of us together need to ensure that this transitional period preceding the election of a new Metropolitan, successor to His Eminence, Metropolitan Philip of eternal memory, be filled with the fragrance of the same love and faithfulness of the perfume that Mary poured out on Christ's head (Cf. Matthew 26:7). Mary's pre-burial ointment prior to the Lord's death (Cf. Matthew 26:12) prefigures our own way of following Christ in this transitional period, on the way of the Cross. Even though the disciples (or Judas) misinterpreted or condemned her action, the Lord asked that this ointment be a prefigurement of the announcement of His resurrection from the dead (Cf. Matthew 26:13). If we share this way, we also share the hope that the Lord proclaimed to Mary on the eve of His passion. As a fact, we will share the gladness that is coming forth from God´s promise to us: the fulfillment of our faith in Him. I am sure that our Lord now "is working" (John 5:17) great things among us for our salvation. Let us follow Him on His way. Let us be His witnesses among our brethren. Let us be His trusted disciples in the service of our church and His co-workers for the salvation of the world.